Here's a monumental moment in the hallowed history of Marvel UK: the time, in January 1974, when the Annex of Ideas' weeklies adopted glossy covers and what became their standard seventies format. Prior to this point, Marvel's UK books had cheap covers and interiors using the same paper stock throughout, except for colour printing on the covers. 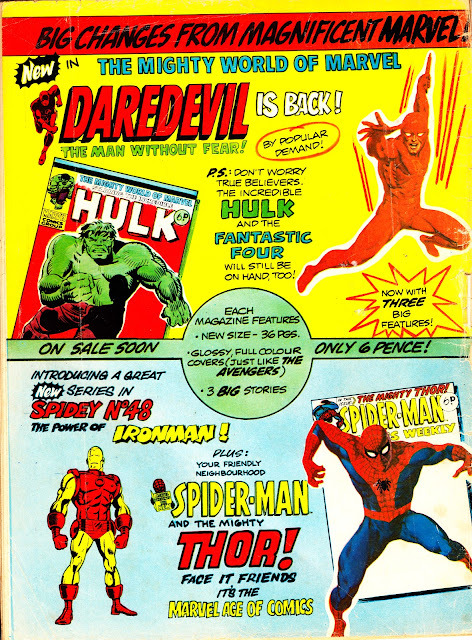 THE AVENGERS weekly was the first to go glossy, from issue one, followed by its older siblings THE MIGHTY WORLD OF MARVEL and SPIDER-MAN COMICS WEEKLY. The glossy covers would remain until January 1979 and Dez Skinn's Marvel Revolution which drastically overhauled the superhero books (what we call the 'Skinn I' format) but left STAR WARS WEEKLY largely unscathed. Glossy covers would stage a triumphant return in 1981 and remain, with a few exceptions (THE THING IS BIG BEN, THE PUNISHER, THE INCREDIBLE HULK PRESENTS etc), until the company became Panini Comics in 1995.